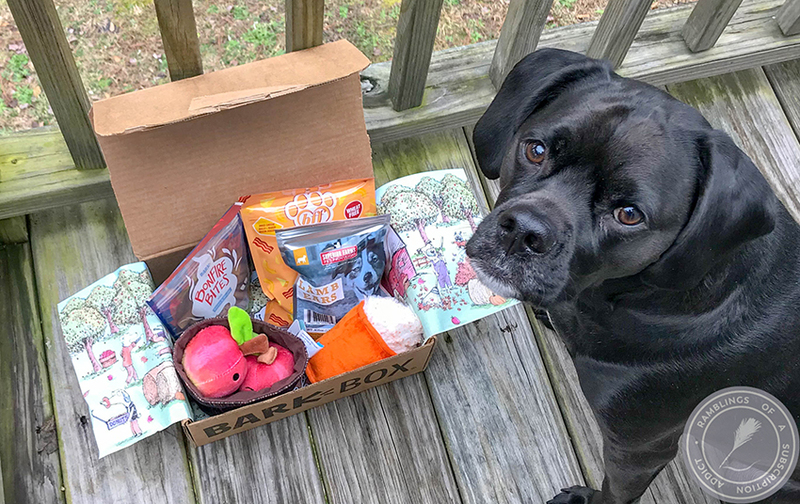 Picture overload warning, this is a thermal! 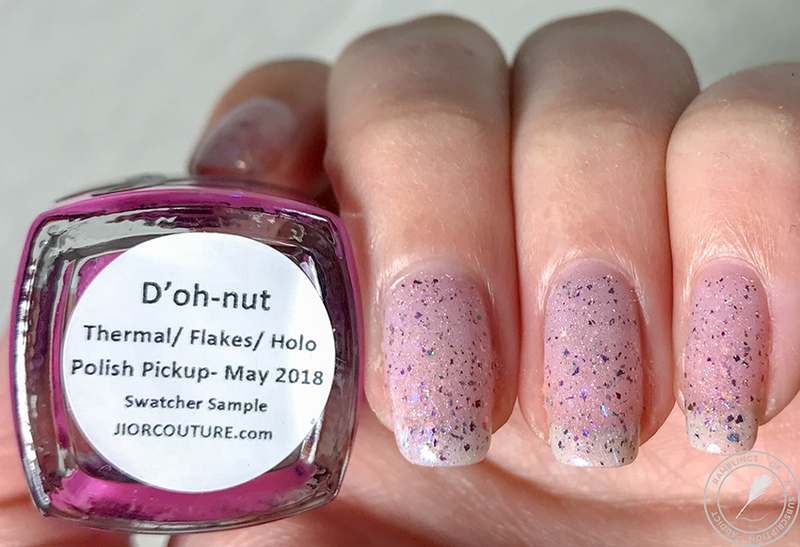 I mentioned Polish Pickup in my last post, but what I didn't say is that I actually have two of the polishes for May to share with you! This is the first post, an offering from Jior Couture. 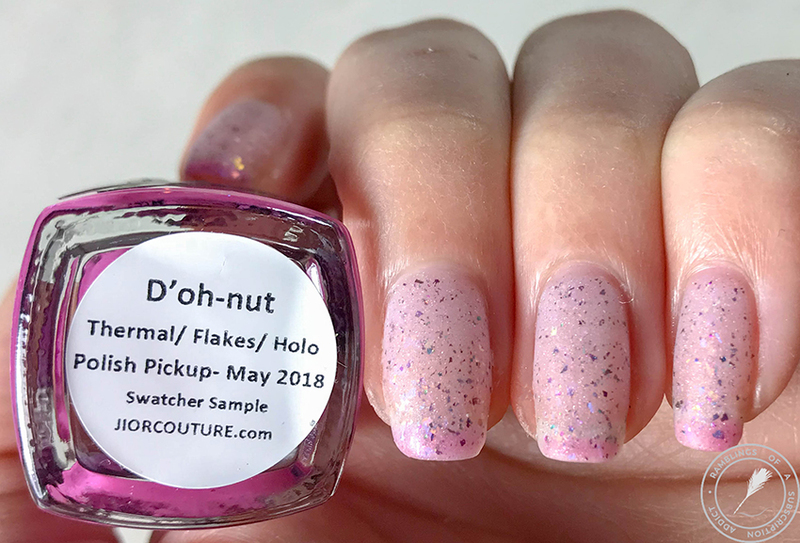 The polish is acutally a thermal that's inspired by the Simpson Lard Lad pink sprinkle donut! 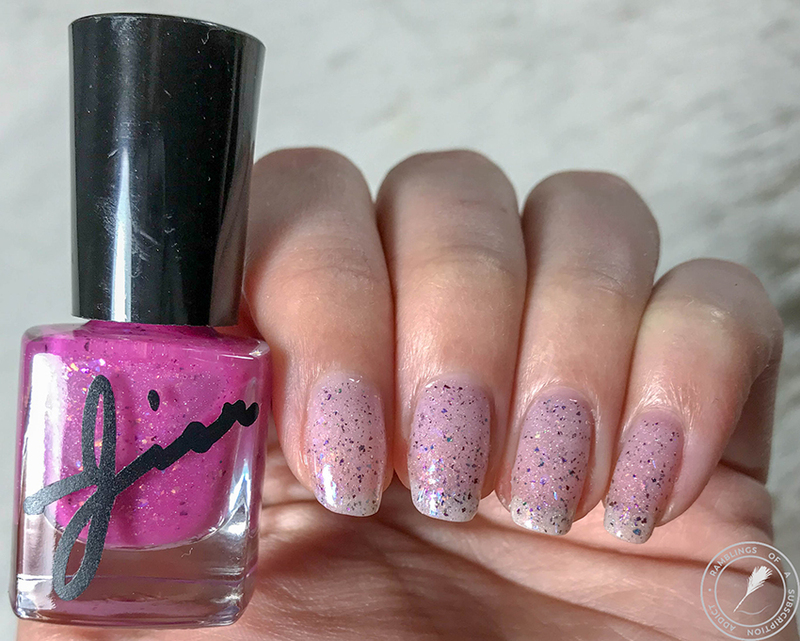 This polish is $11.50! 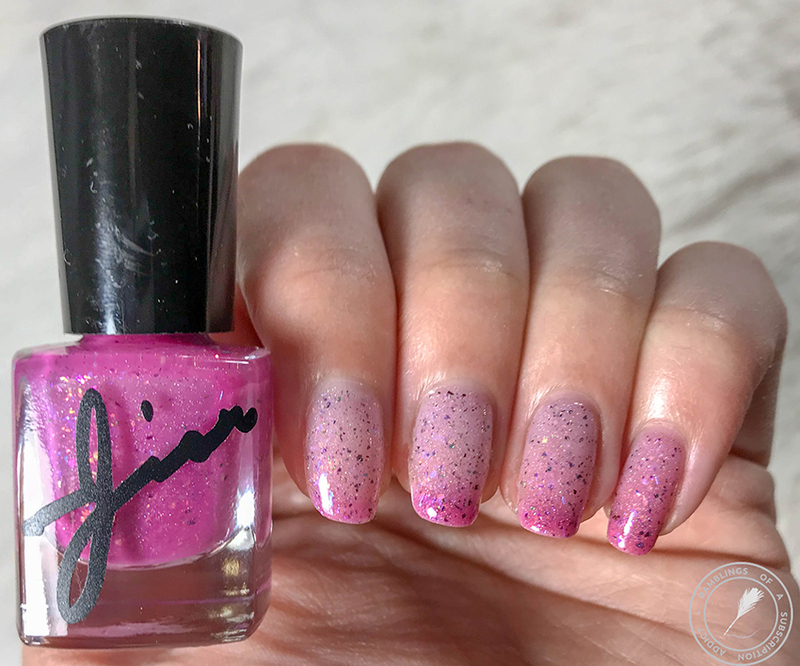 Polish Pickup is a monthly polish shopping extravaganza! 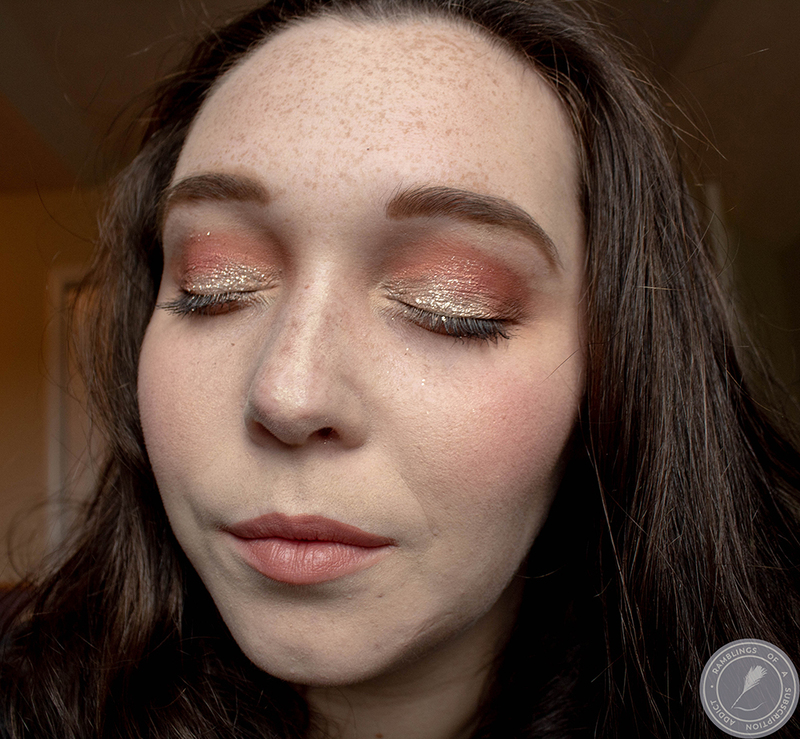 Each month, there's a new theme (voted on by group members) and makers individually decide if they want to participate and create their own polish to meet the theme. 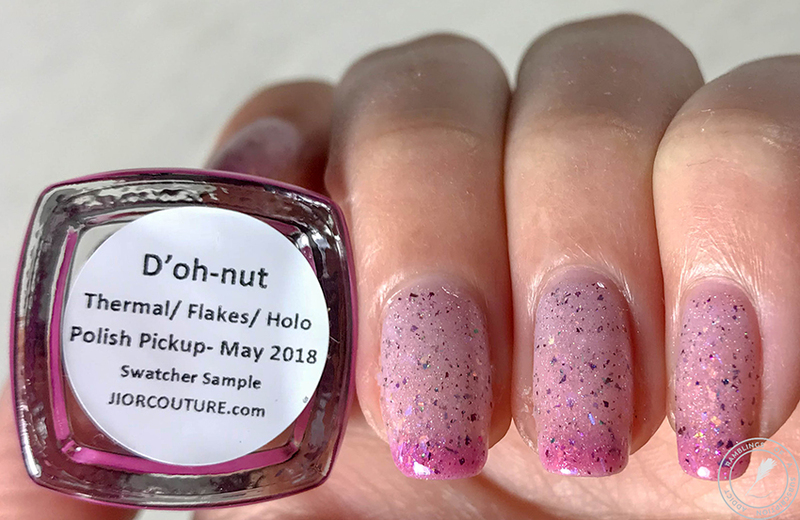 This month, the store is open from 5/4-5/7, and you can buy as many or as few polishes as you want. 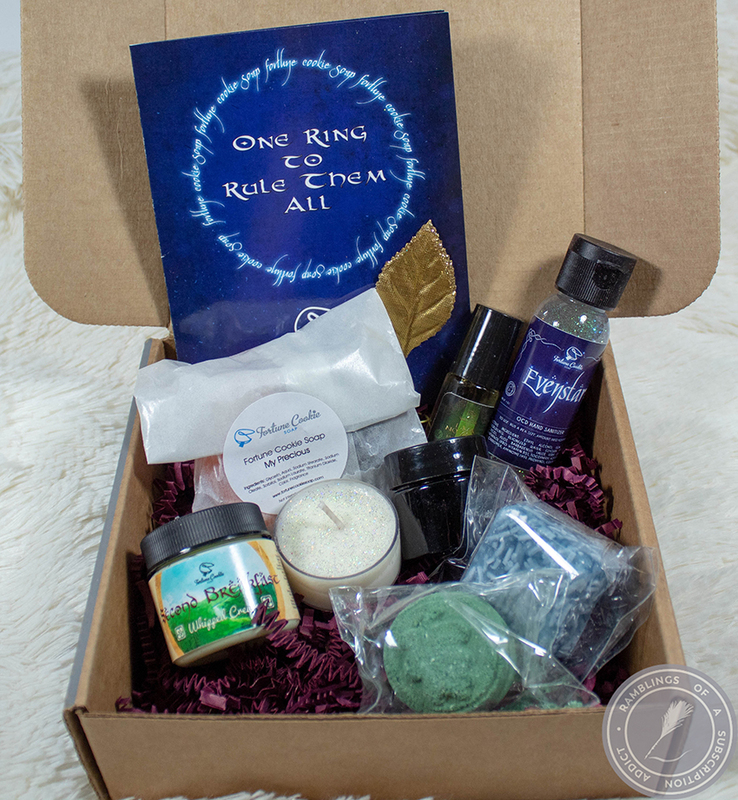 The shipping is $3.00 total (US), no matter how many polishes you get, and they combine shipping if you make more than one order during the weekend! 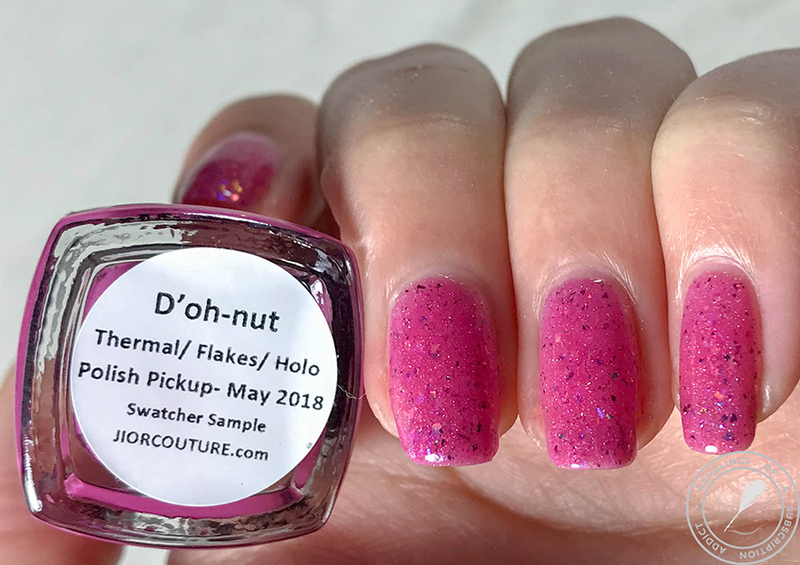 D'oh-nut is a bright pink to light pink/clear thermal with scattered holo and multichrome flakes. 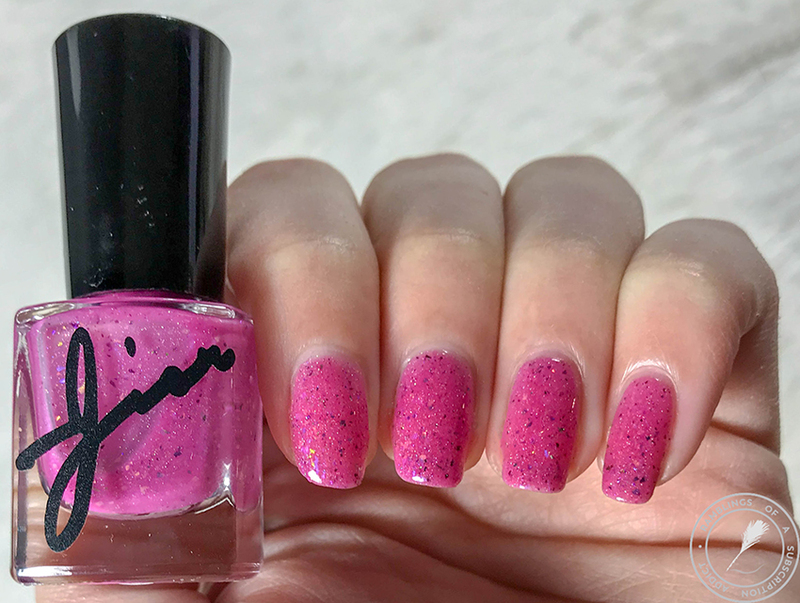 This is how the polish actually looked like while I was wearing this! 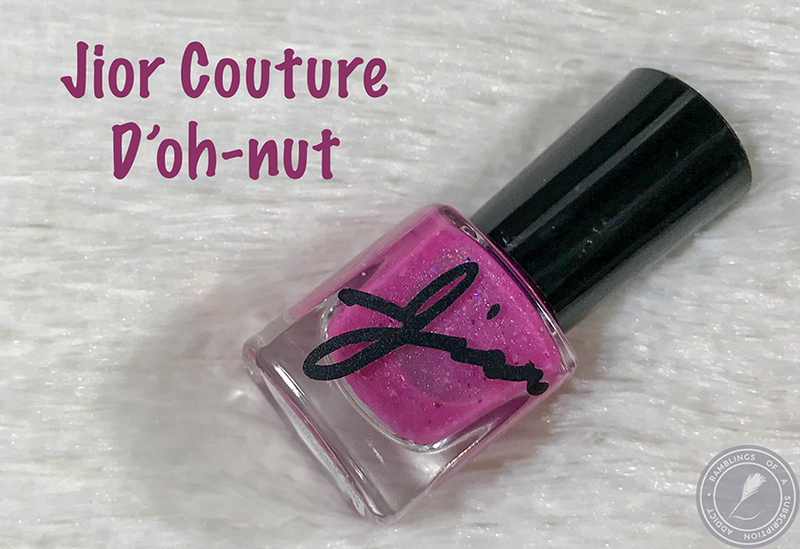 The hot pink is so pretty and fun and is perfect for Spring! To be frank, I had missed that this was a thermal and when it started changing colors, I was super confused. Yikes! I love how nice the flakes look in the warm state. They just show through so nicely! This looks pink on my nail beds but it's not really, my beds are just pink. 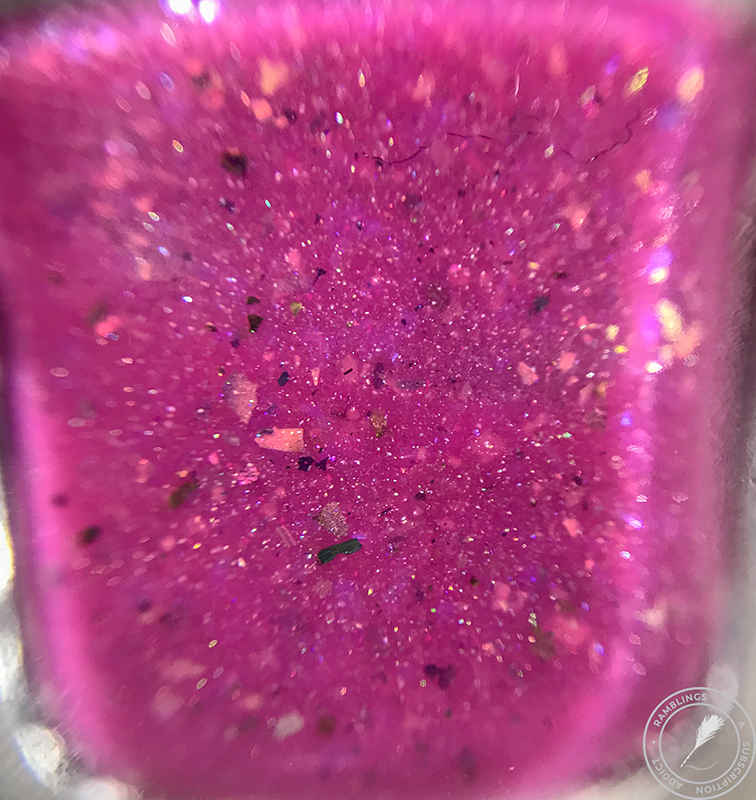 It actually does get to a completely clear base, meaning you could use it over another polish for some thermal art! check out that transition. 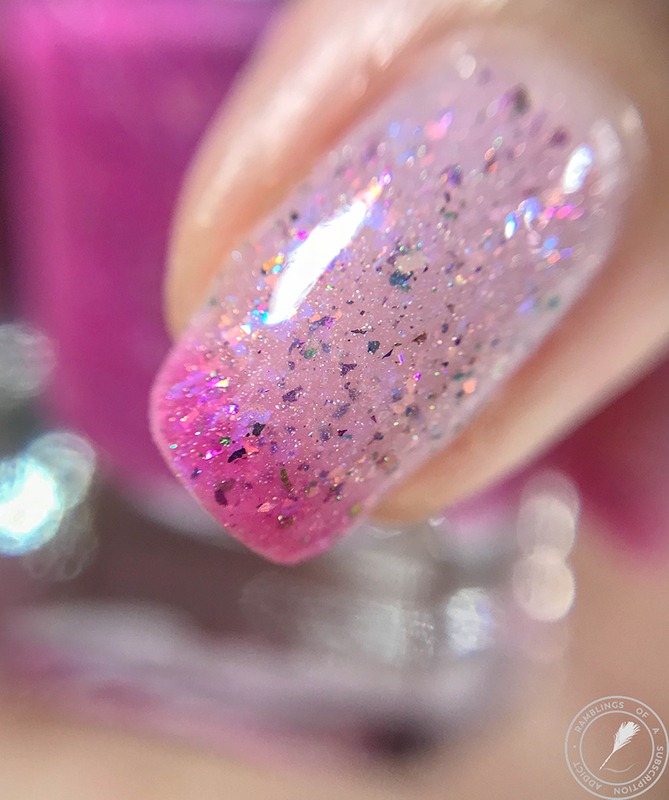 This picture shows the 'mystery' light pink that some of us were able to pull in our pictures, so your transition might be a clear base to hot pink base instead. I don't usually wear a lot of thermals because the transition doesn't end up showing on me easily. I have to super warm my hands and the cool my tips to get it to show (low blood flow, my digits stay cold). I super duper extra love this polish matte. 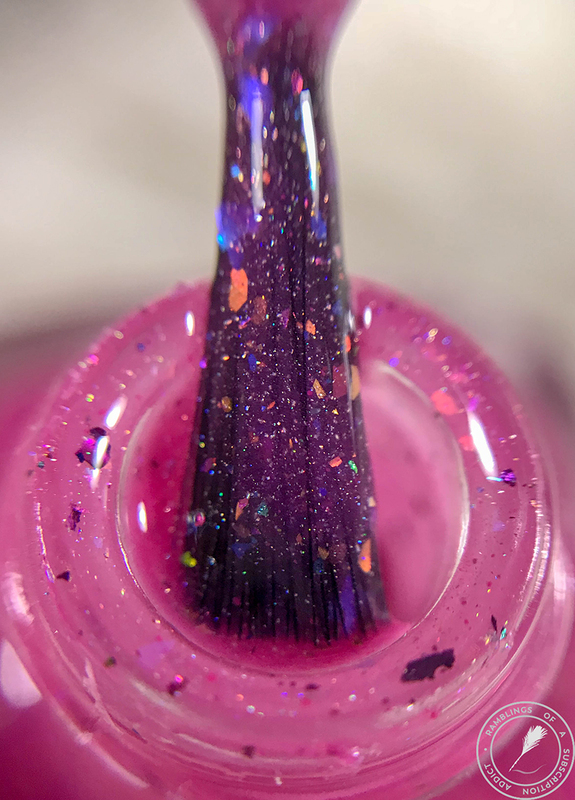 The flakies pop so nicely and the whole polish just looks amazing.